Myanmar's State Counsellor Aung San Suu Kyi. MYANMAR’S LEADER AUNG San Suu Kyi will address the crisis engulfing Rakhine state next week, in her first speech since scores were killed in violence that has sent nearly 380,000 Rohingya Muslims fleeing to Bangladesh and sullied her reputation as a defender of the oppressed. A crackdown by Myanmar’s army, launched in response to attacks by Rohingya militants on 25 August, has pushed vast numbers of refugees from the stateless Muslim minority across the border. The violence has incubated a humanitarian crisis on both sides of the border and put intense global pressure on Suu Kyi to condemn the army campaign, which the UN has described as having all the hallmarks of “ethnic cleansing”. At a press conference yesterday evening, government spokesman Zaw Htay said Suu Kyi would “speak for national reconciliation and peace” in a televised address on 19 September. He said the Nobel laureate, who has been pilloried by rights groups for failing to speak up for the Rohingya minority, would skip the United Nations General Assembly next week to tackle the crisis unfurling at home. She was needed in Myanmar to “manage humanitarian assistance” and “security concerns” caused by the violence. Competing rumours have intensified anti-Muslim rhetoric across the Buddhist-majority country. In the northern area of Rakhine, 176 of the 541 Rohingya villages there were empty after “the whole village fled”, Zaw Htay said, adding others were partly deserted or intact. 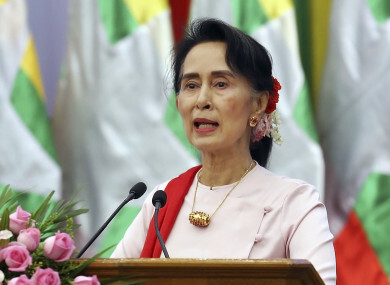 Suu Kyi has been condemned for a lack of moral leadership and compassion in the face of a crisis that has shocked the international community. Her limited comments so far have referenced a “huge iceberg of misinformation” and played down alleged atrocities against the Rohingya. Bangladesh is struggling to provide relief for exhausted and hungry refugees — some 60% of whom are children — while nearly 30,000 ethnic Rakhine Buddhists as well as Hindus have also been displaced inside Myanmar. Suu Kyi, Myanmar’s first civilian leader in decades, has no control over the powerful military, which ran the country for 50 years. A free election was finally held in 2015. There is also scant sympathy among Myanmar’s Buddhist majority for the Rohingya, who are branded “Bengalis” — shorthand for illegal immigrants. But outside of her country Suu Kyi’s reputation as a human rights champion is in ruins. Rohingya refugees have told chilling accounts of soldiers firing on civilians and razing entire villages in the north of Rakhine state with the help of Buddhist mobs. Ahead of the meeting 12 Nobel laureates signed an open letter urging the Security Council to “intervene immediately by using all available means” to end the tragedy and “crimes against humanity” unfolding in Rakhine. While the US and other Western powers — as well as the Muslim world — have criticised the military campaign, Beijing offered Myanmar support on Tuesday — saying the country was entitled to “safeguard” its stability. Human Rights Watch’s Phil Robertson urged the Security Council to pass a “global arms embargo” on Myanmar’s military but said he expected China to to water down any moves. The 1.1-million strong Rohingya have suffered years of discrimination in Myanmar, where they are denied citizenship even though many have long-lasting roots in the country. Many Rohingya have died making the perilous journey across the border, with nearly 100 drowning in boat trips across the Naf river that divides the two countries. Email “Nobel prize winner Aung San Suu Kyi to finally address Rohingya crisis next week”. Feedback on “Nobel prize winner Aung San Suu Kyi to finally address Rohingya crisis next week”.